Industrial boilers are closed vessels that use a fuel source or electricity to heat water or generate steam for industrial heating and humidification applications. Industrial boilers are used in industrial heating applications such as cement production, and medicine manufacturing. Energy efficient industrial boilers along with clean fuel boilers are in high demand in Saudi Arabia market due to global environmental concerns and to reduce operational expenses. 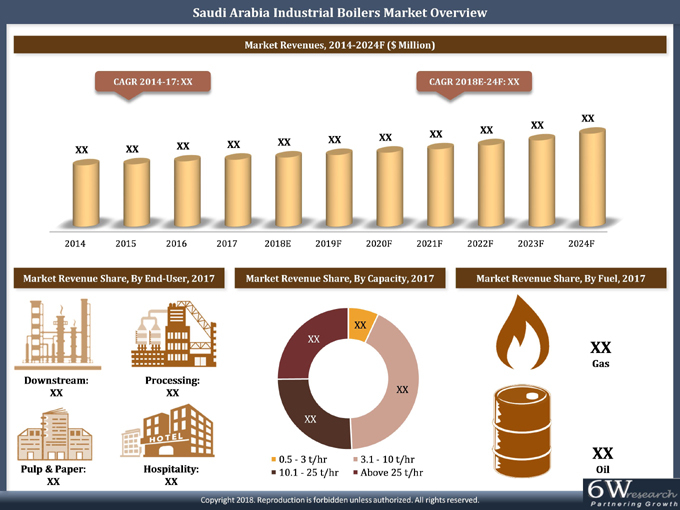 According to 6Wresearch, Saudi Arabia Industrial Boilers market size is projected to grow at a CAGR of 5.0% during 2018-24. The revenues for Saudi Arabia Industrial boilers market forecast period is anticipated to register moderate growth on account of growing demand for refined petroleum products and rising steam demand in processing industries. Diversification of economy would further boost Saudi Arabia industrial boilers market shares in pharmaceutical, chemical, textile, plastic and cement industries. Growing tourism and hospitality sector in the country would be the key factors that would spur the market for industrial boilers in Saudi Arabia. Low capacity industrial boilers ranging from 0.5-10 tonnes/hr are expected to grow rapidly in the country due to their widespread applications across hospitality and food & beverage industries. Additionally, growing investor confidence and rise in government spending for infrastructure development are likely to propel the need for steam, which is used for various industrial operations, thus driving the market for industrial boilers in Saudi Arabia. The Saudi Arabia industrial boilers market report thoroughly covers market by capacity, type, fuel, end user and regions. The Saudi Arabia industrial boilers market outlook report provides an unbiased and detailed analysis of the on-going Saudi Arabia industrial boilers market trends, opportunities, high growth areas and market drivers which would help the stakeholders to device and align their market strategies according to the current and future market dynamics. 15.6. Hurst Boiler & Welding Co, Inc.
15.8. Al Saghyir Boilers & Pressure Vessels Factory Ltd.
15.10. Forbes Marshall Pvt. Ltd.